My Holiday Photos. : Edinburgh Scotland. We arrived in South Queensferry which is the tender port for Edinburgh. When we took our tender ashore we saw that a previous one had got stuck on a mud bank and another one was trying to pull it free. They were there for over an hour so I am very glad we hadn't gone ashore a few minutes earlier. 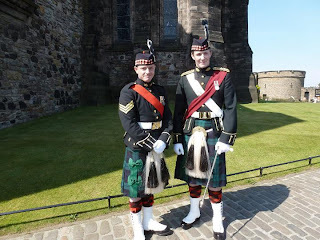 We decided we would go to Edinburgh castle as the last time we were there we took the HOHO bus and didn't have time to go in. Two Scots Guards on duty. Once you get inside the castle gates it is not at all as I expected a castle to look like. It looks more like a town with roads and houses. 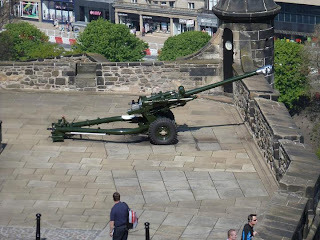 The One o' clock gun which gets fired daily. There was a lovely view out across Edinburgh from the castle. The Forth Rail Bridge which was opened in 1890. Our ship is just visible behind it. I hope you have enjoyed our British Isles cruise, and if so, come back soon to see the pictures from Scandinavia.